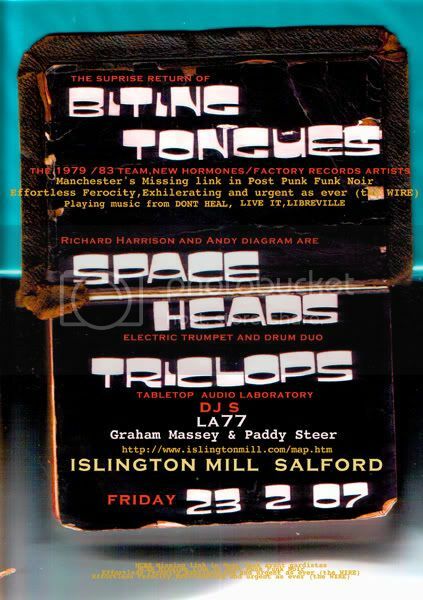 Just been firming up a Manchester date for the origenal line up of Biting Tongues to perform . be either feb 22 or 23 rd @ Islington Mill in Salford. Nice one - I'm definitely making this! Luckily, because I work in Telford until most Thursday's, if it is on a Thursday, instead of going to London (from Wolverhampton), I can instead get on the train going in the opposite direction to Manchester Picadilly! Might be able to get away with charging the train fare back to the company! markus are you still busy that weekend? PM me if you can meet for a beer or two. all the success in the world and please everybody, full coverage!